Once you have enabled all of the required features, you can choose which additional options you want to enable or configure in JungleMail. In this tutorial, you will learn what the included options for configuring JungleMail settings are and how to activate them. All of these can be managed (globally) in Central Administration settings and (locally) per site collection in the site collection settings. You will find the Global Settings for JungleMail in your Central Administration. Note: if you want to manage your settings per site collection, read the tutorial here. JungleMail offers several options to specify the 'From' and 'Reply-to' address for your sent campaigns. By default, the outgoing email settings for the Web Application are used. If you want the email address of the user who created the campaign to show as the 'From' and 'Reply-to' address, then select 'JungleMail job author'. You also have the option to enter an email address manually. Read more about custom "From" and "Reply-To" addresses here. If you want there to be a delay between sent emails, you can set this here. If you want there to be no delay between sending emails, enter '0' in the delay field. The SMTP configuration allows you to specify an outgoing email server. If you want to access Exchange objects such as Dynamic Distribution Groups and Distribution Groups you should enable Microsoft Exchange Service Connector. You can read more about JungleMail Exchange Web Service connector here. If you want certain people to receive a copy of all campaign emails sent, you can enter their email addresses here. The author of a new campaign will see these recipients, but will not be able to remove them if the checkbox allowing users to edit this field is not selected. Use commas or semicolons to separate email addresses. If you want to specify 'BBC' addresses for your future campaigns you can do that here. Use commas or semicolons to separate email addresses. Note: this feature is only available in the JungleMail Pro and Enterprise editions. If you want to make use of the Cumulative Reports (Analytics) feature in JungleMail, you should enable it here. You are also able to configure the Cumulative Reports here. You can read more about configuring Cumulative Reports here. Note: this feature is only available in JungleMail Enterprise Edition. 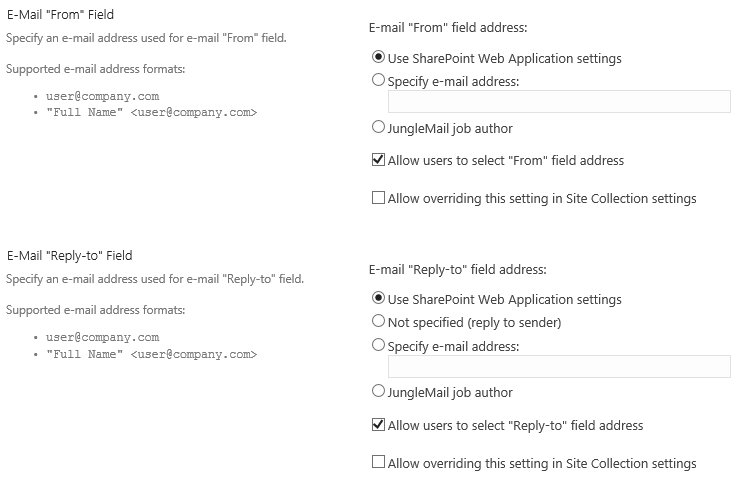 Note: to open Cumulative Reports, click Show direct access link in JungleMail Global Settings. Use this link to access the Cumulative Reports page. For easier access , you can save the link in the quick launch ribbon by adding a new link and pasting the URL. Do not forget to add permissions for users who will access Cumulative reports on this Site Collection. It is not possible to access Cumulative Reports by opening its host site collection. This site will be empty when accessed from the UI.